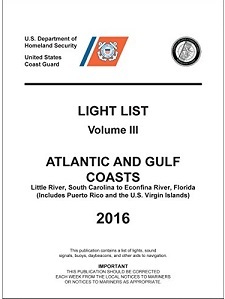 The U.S. Coast Guard "Light List" is published in (7) volumes covering the waters surrounding and within the United States and its Territories. The Light List is intended to furnish much more detailed information concerning each aid to navigation (ATON) than can be conveniently shown on a nautical chart. It provides this information on any ATON used for general navigation. This includes lighted and unlighted buoys, daybeacons, sound signals, radiobeacons, radio direction finder calibration stations, and racons. 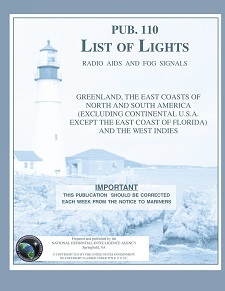 The Light List is published by the U.S. Coast Guard. (6) Volumes are published annually and (1) volume bi-annually. Each volume of the Light List details the aids to navigation in geographic order from north to south along the Atlantic coast, from east to west along the Gulf coast, and from south to north along the Pacific coast. It lists seacoast aids first, followed by entrance and harbor aids listed from seaward. Intracoastal Waterway aids are listed last in geographic order in the direction from New Jersey to Florida to the border of Texas and Mexico. The Light List is not intended to be used in place of nautical charts or Coast Pilots, but as an adjunct to good navigation practices. Not included are Coast Guard mooring buoys and some buoys having no lateral significance; such as special purpose, anchorage, fish net, and dredging. The National Geospatial-Intelligence Agency (NGA) publishes a List of Lights, Radio Aids and Fog Signals that are maintained by or under the authority of foreign governments. The list is published in seven volumes, as Publication numbers 110 through 116 and are usually referred to as the List of Lights, and should not be confused with the U.S. Coast Guard's Light List. Each volume Corresponds to a defined geographic region as shown on the index chartlet on the inside front covers. Major fixed and outermost floating aids to navigation, such as sea buoys, safety fairway buoys, traffic separation buoys, etc., are listed. Other floating aids are not generally listed. In addition to the information on lighted aids to navigation and sound signals, the List of Lights provides information on storm signals, signal stations, racons, radiobeacons, and radio direction finder calibration stations located at or near lights. Radiobeacons are listed in a separate section in the back of each volume. Each volume contains more details about the navigational aids than can be conveniently shown on nautical charts. New editions are published annually throughout the year for every volume. Publication #110 (2018) - Greenland, The East Coasts of North and South America (excluding Continental U.S.A. except the East Coast of Florida) and The West Indies. Publication #111 (2018) - The West Coasts of North and South America (excluding the Continental U.S.A. and Hawaii), Australia, Tasmania, New Zealand, and the Islands of the North and South Pacific Oceans. Publication #112 (2018) - Western Pacific and Indian Oceans Including the Persian Gulf and Red Sea. Publication #114 (2018) - British Isles, English Channel, and North Sea. Publication #115 (2018) - Norway, Iceland, and Arctic Ocean. Publication #116 (2019) - Baltic Sea with Kattegat Belts and Sound, and Gulf of Bothnia. (New!) 2019 Edition.